Take one part enthusiasm, two parts commitment, and a dash of dedication, and you have a recipe for success with one of the Junior League of Tulsa’s (JLT) most established programs, the Harvest Market committee. This year’s committee chair, Casey Palmateer, explains how JLT is making an impact in our community through Harvest Market. The Harvest Market, which opened in 2009, is a collaboration between Global Gardens, First United Methodist Church, and Eugene Field Elementary. It serves approximately 1,000 low-income families in the Eugene Field neighborhood, which is considered a food desert. A food desert is defined as an urban area where the nearest regular grocery store is more than a mile away. Palmateer says many families have to arrange transportation or take the bus to get to a grocery store. The alternative is fast food or what is available at area convenience stores. “This severely limits the healthy and fresh food families are exposed to, and we want to change that,” she says. The Harvest Market has a grocery store, art studio, classroom, and teaching kitchen where JLT holds workshops. 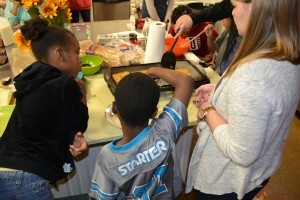 ­­­­­JLT provides cooking classes for youth and their caregivers, educating them on how to prepare low-cost, healthier food options at home. 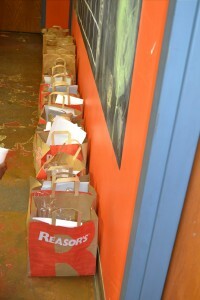 After the classes, the children receive the recipes to make at home, and JLT sends groceries home with them as well. “The goal of the JLT-facilitated workshop is to expose children and families to healthy, fresh, inexpensive recipes and empower them through hands-on learning to recreate them at home,” Palmateer says. 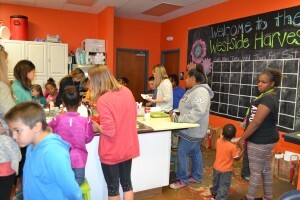 The workshops, attended by approximately 30 students and adults, are held on Saturdays at Eugene Field Elementary in West Tulsa. The recipes, such as Apple Peanut Butter Snack Bars and Three-Ingredient Pancakes, are definitely kid-tested and approved. (You can view and download a sampling of recipes here.) 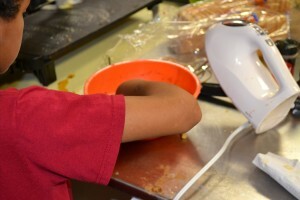 At the conclusion of each workshop, participants go home with the ingredients, so they can recreate the recipe. Plus, they can shop The Harvest Market for donated groceries from Reasor’s, Sprouts, Whole Foods, and Walmart. This is the fifth year for JLT to be involved with the program. Children’s health and wellness has been a key issue for Junior Leagues since the national founding in 1901. Today, a critical element of JLT’s ongoing commitment is teaching kids and their parents about the importance of eating healthy foods and involving them in the fight against childhood obesity. Making the magic happen in the kitchen requires that JLT committee members often bring equipment from their own kitchens for the workshops. However, Palmateer hopes to one day have the school kitchen stocked. On her equipment wish list are sharp knives, spatulas, mixing bowls, mixing spoons, measuring cups/spoons, hand mixers, a food processor, and an electric skillet. Donations are being accepted at JLT headquarters, or you may contact Palmateer. She’s happy to pick up donations, so the kids can keep cooking.